Details relating to the Maltese Commemorative of 2014. 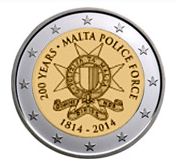 This coin commemorates the 200th anniversary of founding of the Maltese police. The Maltese police are therefore one of the oldest police forces in Europe. The motif shows the service badge of the police. This has two inscriptions “PULIZIJA TA MALTA2 – Police of Malta – in the local language and DOMINE DIRIGE NOS – God direct us. This is in Latin and is presumably the motto of the police force. Around the edge of the inner circle is the inscription “ 200 YEARS · MALTA POLICE FORCE” . At the bottom are year of founding and the year of issue – 1814 and 2014. The coin does not have a mint mark. Return from Maltese Commemorative 2014 to euro coin collector. I have created two Excel sheets for Euro Coin Collectors. The first gives a detailed breakdown - by year and country - of all the Two Euro Commemorative Coins minted up to the end of 2018. The second enables you to keep a record - of all the Two Euro Commemorative Coins in your collection. Please enter the details in the form hereunder and I will send the Excel sheets to you.